Kelp is the common name for any of the large seaweeds comprising the order Laminariales within the brown algae (class Phaeophyceae). There are about 30 different genera of kelp, largely found in colder seas along coastlines in the Northern Hemisphere. Some species grow very long and form kelp forests. 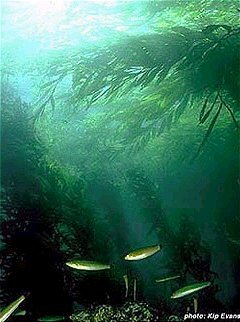 Kelp forests are underwater areas in temperate and polar coastal oceans with a high density of kelp and are recognized as one of the most productive and dynamic ecosystems on earth. 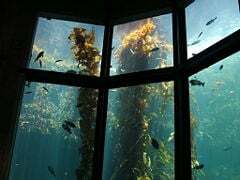 Ecologically, kelp provide a physical substrate and habitat for animals, as well as food for such aquatic organisms as sea urchins, seastars, isopods, kelp crabs, and herbivorous fishes. For humans, kelp has long been used as a source of nutrition, providing such elements as iodine, calcium, iron, and diverse vitamins, and its use in medicine traces as far back as 3,000 B.C.E. in China. Kelp often is recommended today by naturopaths and herbalists for various conditions, such as thyroid disorders. Kelp is particularly important as part of present-day Japanese cuisine. Through the nineteenth century, the word "kelp" was closely associated with seaweeds that could be burned to obtain soda ash (primarily sodium carbonate). The seaweeds used included species from both the orders Laminariales and Fucales. The word "kelp" was also used directly to refer to these processed ashes. Kelp is a type of seaweed, often large, within the order Laminariales of the brown algae. Seaweeds are macroscopic, multicellular, marine algae, which generally are benthic, being anchored to the bottom of the ocean or to solid structures. Brown algae comprise a large group of multicellular, mostly marine algae. Brown algae are placed in the class Phaeophyceae, but their higher level classification is not settled, being variously placed in in the kingdoms Plantae, Protista, Chromista, or Chromalveolata, and in the Divisions Heterokontophyta or Phaeophyta. Giant kelp in the Monterey Bay Aquarium. In addition, many kelp species have pneumatocysts, or gas-filled bladders, usually located at the base of fronds near the stipe. These structures provide the necessary buoyancy for kelp to maintain an upright position in the water column. Growth occurs at the base of the meristem, where the blades and stipe meet. Growth may be limited by grazing. Sea urchins, for example, can reduce entire areas to urchin barrens. The kelp life cycle involves a diploid sporophyte and haploid gametophyte stage. The haploid phase begins when the mature organism releases many spores, which then germinate to become male or female gametophytes. Sexual reproduction then results in the beginning of the diploid sporophyte stage which will develop into a mature plant. Kelp grows in underwater "forests" (kelp forests) in clear, shallow oceans. It requires nutrient-rich water below about 20°C (68°F). Kelp is known for its high growth rate: the genus Macrocystis and Nereocystis luetkeana grow as fast as half a meter a day, ultimately reaching 30 to 80 meters (Thomas 2002). Kelp provides a variety of commercial uses, as well as being used in various cuisines and for medicinal purposes. Giant kelp can be harvested fairly easily because of its surface canopy and growth habit of staying in deeper water. Kelp ash is rich in iodine and alkali. 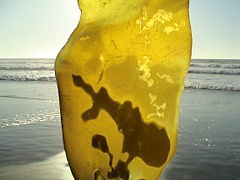 In great amount, kelp ash can be used in soap and glass production. Until the Leblanc process was commercialized in the early 1800s, burning of kelp in Scotland was one of the principal industrial sources of soda ash (predominantly sodium carbonate) (Clow and Clow 1952). Alginate, a kelp-derived carbohydrate, is used to thicken products such as ice cream, jelly, salad dressing, and toothpaste, as well as an ingredient in exotic dog food and in manufactured goods. The Greeks used it to feed their cattle as far back as the first century B.C.E. Kelp is also used frequently in seaweed fertilizer, especially in the Channel Islands, where it is known as vraic. Kelp is a rich source of iodine, calcium, and sulfur, and a good source of iron, phosphorus, sodium, potassium, magnesium, and the vitamins A, D, E, K, and B complex. The main constituents of kelp are mucopolysaccharides, algin, phenolic compounds, polar lipids, and glycosyl ester diglycerides, as well as protein, carbohydrates, essential fatty acids, and about thirty minerals (Wurges and Frey 2005). Kelp has been eaten for its nutritional value or for medicine for thousands of years, with the Chinese using it as far back as 3,000 B.C.E. and the Japanese including it in their diets for 1,500 years. It has been a staple food in Iceland for centuries (Wurges and Frey 2005). Kelp is an important part of the present day Japanese diet, being used in salads, as a garnish, and in soups, sauces, and cakes, as well as to make noodles (Wurges and Frey 2005). Kombu (Laminaria japonica and others), several Pacific species of kelp, is a very important ingredient in Japanese cuisine. Kombu is used to flavor broths and stews (especially dashi), as a savory garnish (tororo konbu) for rice and other dishes, as a vegetable, and a primary ingredient in popular snacks (such as tsukudani). Transparent sheets of kelp (oboro konbu) are used as an edible decorative wrapping for rice and other foods (Kazuko 2002). Kombu can be used to soften beans during cooking, and to help convert indigestible sugars and thus reduce flatulence (Graimes 1999). As a rich source of minerals, kelp is often recommended for medicinal purposes. It has been recommended by herbalist and naturopathic practitioners for thyroid disorders, arthritis, high blood pressure, colds, obesity, goiter, eczema, constipation, nervous disorders, low vitality, and other conditions. It is considered to be beneficial to the functioning of the nervous and endocrine systems, and enhance the function of the thyroid, adrenal, and pituitary glands. In particular, it is recommended for thyroid conditions, such as hypothyroidism and goiter, which is attributed partly to its high iodine content (Wurges and Frey 2004). It is noted that the Japanese, who eat a lot of kelp, have a low rate of breast cancer, heart disease, thyroid disease, respiratory disease, arthritis, high blood pressure, and gastrointestinal ailments, which may be attributed to kelp (Wurges and Frey 2004). Kelp is also thought to reduce cholesterol levels. However, the high sodium content could make high blood pressure worse and people with high blood pressure or a history of thyroid problems should consult their physicians before using kelp. Excessive consumption can lead to too much iodine (Wurges and Frey 2004). And gathering and using wild kelp poses risk because of contaminants from the sea. Because of its high concentration of iodine, brown kelp (Laminaria) has been used to treat goiter, an enlargement of the thyroid gland caused by a lack of iodine, since medieval times (Newswise 2008). Bull-head kelp, Nereocystis luetkeana, a northwestern American species. Used by coastal indigenous peoples to create fishing nets. Giant kelp, Macrocystis pyrifera, the largest seaweed. Found in the Pacific coast of North America and South America. Kombu, Laminaria japonica and others, several edible species of kelp found in Japan. A comprehensive listing of species in Laminariales and nearly all other algae orders is publicly accessible at http://www.algaebase.org (Guiry and Guiry 2008). Clow, A., and N. L. Clow. 1952. Chemical Revolution. Ayer Co Pub. ISBN 0836919092. Dayton, P. K. 1985. Ecology of kelp communities. Annual Review of Ecology and Systematics 16: 215-245. Graimes, N. 1999. The Best-Ever Vegetarian Cookbook. Barnes & Noble. ISBN 0760717400. Guiry, M. D., and G. M. Guiry. 2006. AlgaeBase, version 4.2. National University of Ireland, Galway. Retrieved October 13, 2008. Integrated Taxonomic Information System (ITIS). 2004. Phaeophyta. ITIS Taxonomic Serial No. : 660055. Retrieved October 13, 2008. Kazuko, E. 2002. Japanese Cooking. Hermes House. ISBN 0681323272. Newswise. 2008. Iodine helps kelp fight free radicals and may aid humans, too. Newswise June 17, 2008. Retrieved October 13, 2008. Thomas, D. 2002. Seaweeds. The Natural History Museum, London. ISBN 0565091751. Wurges, J., and R. J. Frey. 2005. In J. L. Longe, The Gale Encyclopedia of Alternative Medicine, Farmington Hills, Mich: Thomson/Gale. ISBN 0787693960. This page was last modified on 16 October 2008, at 19:34.